Let’s talk podcasts! 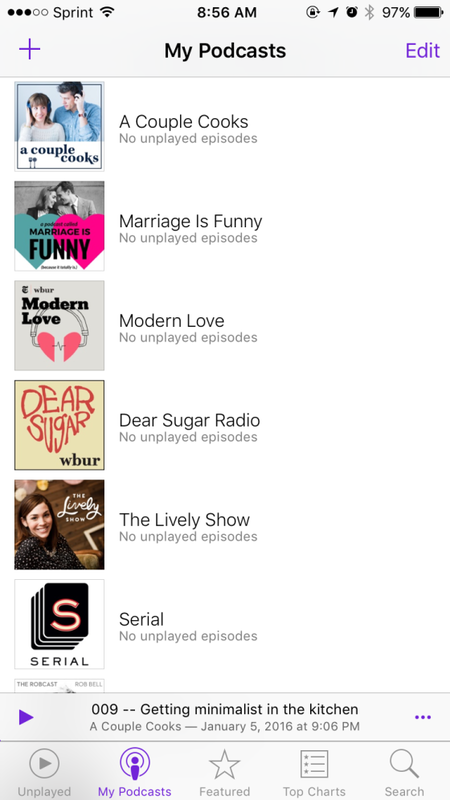 Podcasts are a sort-of new thing to me. For the longest time I just didn’t “get” them but now looking back I have no idea what was so confusing to me! For my job I spend a lot of time in the car and listening to music only goes so far. A while back I found that audio books are a good alternative. And then early last year, when the world was reeling over the first season of Serial, I started listening while on a long drive and from then, I have been hooked! So, I thought I would what is currently keeping me entertained. A Couple Cooks – this one is the newest on my list and I’ve actually only listened to one episode, but so far I’m a fan. A Couple Cooks is also a food blog, so double-win. I love their approach to food. Marriage is Funny – this one is also fairly new (and they introduced me to A Couple Cooks) but it has quickly, no, very quickly become my #1 favorite. Jessie and Gerard are a married couple who have honest conversations with each other that are so real and authentic and funny. I seriously find myself laughing aloud when I am listening to these episodes. Their approach to “great love” is so note-worthy. Seriously, you can’t go wrong with this one! Modern Love – New York Times column meets e-radio in this simple podcasts which features reader-submitted stories about love. Some of the episodes have been interesting, and some not. I just choose to listen when the tagline intrigues me. Dear Sugar – So, this one contends with Marriage is Funny as my favorite. I was introduced to this one by my friend Adam just a few months ago and in that time I have gone back and listened to almost all of the episodes. This one also started as an online advice column where people would write in to “Sugar” and “she” would respond with advice. At first “she” was Steve Almond and eventually Cheryl Strayed took over as the voice of Sugar. Down the road the two joined forces for Dear Sugar Radio and, man, these two souls are so amazing. Both have such deep backgrounds which they openly share on the podcast. They talk about everything from friendship, to love, work, jobs, infidelity, parenthood, family struggles and everything in between. They tend to be very straight forward with their advice and answers, but in a loving way, and they give advice as not to tie up a problem into a nice little bow, but to provoke thought and encourage work for the writer/listener to come up with a solution to the problem. I just love these two! The Lively Show – I have listened to Jess Lively off and on for a while now. My interest in this one comes and goes. I think that is because it’s entrepreneurial in nature, and that doesn’t fit me so well, but lately the shows have been extremely interesting and just last week Jess interviewed Brene Brown. It was so amazing! Jess also talks a lot about values and intentions which are good things for all of us to be aware of, and tune into. I have been introduced to some of my favorite lifestyle bloggers & Instagrammers through The Lively Show, like Crystal Palacek (perfectionism & pregnancy – loved this one while I was pregnant), Jessica Turner of The Mom Creative (the Fringe Hours will change your life), Alexandra Franzen (the power of saying “no”), Caroline Rector of Un-fancy (stepping away from “success”, and capsule wardrobes), Jessica Flannigan of Live the Fancy Life (finding peace – as a new mom this one was spot on! ), Katie Richardson of Puj (stop the glorification of “busy”!). If you can’t tell, I get a lot out of this podcast! Serial – Everyone knows about this one so I won’t write a novel about it. All I will say is that I absolutely loved season one and listened to it in just a couple of days. Season two, however, was boring to me from episode one. I need to try to give it another listen, though. Anyone relate? Robcast – This one is hosted by Rob Bell. I’ve only listened to a couple of episodes so far. On the most recent episode of Marriage is Funny, the Peppers talked about politics and mentioned a particular stance on how to communicate others on the subject of politics (at work, family functions, etc.) that might otherwise lead to tension and arguments, which they had heard on a Rob Bell podcast. He did a 6-part series on “Politics and Guns” which I am currently listening to and so far have enjoyed it. It’s educational and very helpful when navigating tricky waters of politics. I don’t know if I will stay subscribed to this one, but will definitely give a few more episodes a listen. Whew! That pretty much sums up my current podcast feed, other than a few random saved episodes. 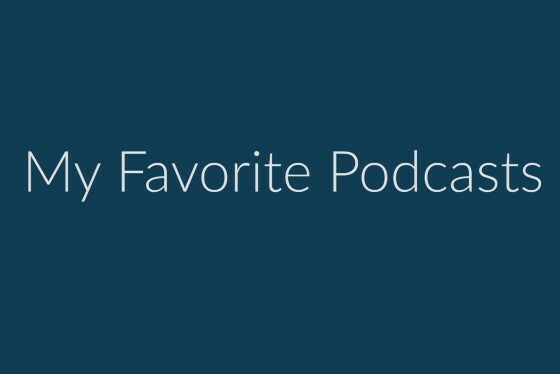 What are your must-listen-to podcasts? I’ve been listening to Anna Faris is Unqualified. She and her rotating celeb guests give relationship advice, etc. It’s pretty raunchy – but also pretty hilarious! Thanks Julie! I love those hosts who make you laugh aloud. Great suggestion. Thanks for that suggestion, that is a new one! Hope you are well, friend!